Chuck, with his old dorm in the background. On the last full day of our Arizona trip we opted to stay close to our hotel and venture out and about the Arizona State University Campus and neighborhood. Walking the campus, Chuck and I commented numerous times how different things were from the time we were college students. I went to San Jose State, but never graduated; we were on Chuck’s turf today, so I let it be all about him, as it should be. Needless to say, every other student we passed on our ASU pilgrimage was ensconced in Cellphonedome. No worries, and no different from our everyday lives, but it still didn’t take away from how drastically things have changed since Chuck was an ASU student (in what seemed to be) not so long ago. Chuck also commented on how there just seemed to be so many more options, more things to do, and definitely more things to eat — we giggled as we strolled by a sushi restaurant with actual Japanese chefs, in the student union. Strolling through the ASU campus is always an endearing experience for me, mainly because it means something to the man I am married to. I wonder for a moment if back then, he ever imagined he would be married to someone like me? Who knows, and who cares, for that matter, as it is not about me. As Chuck and I meandered through the old College of Architecture building, I commented aloud how, as much as we now take our careers somewhat for granted, that there were Architecture students in that building in the here and now, who dreamed of owning their own firms, designing million-dollar remodels and truly loving what they do, just like Chuck does now. 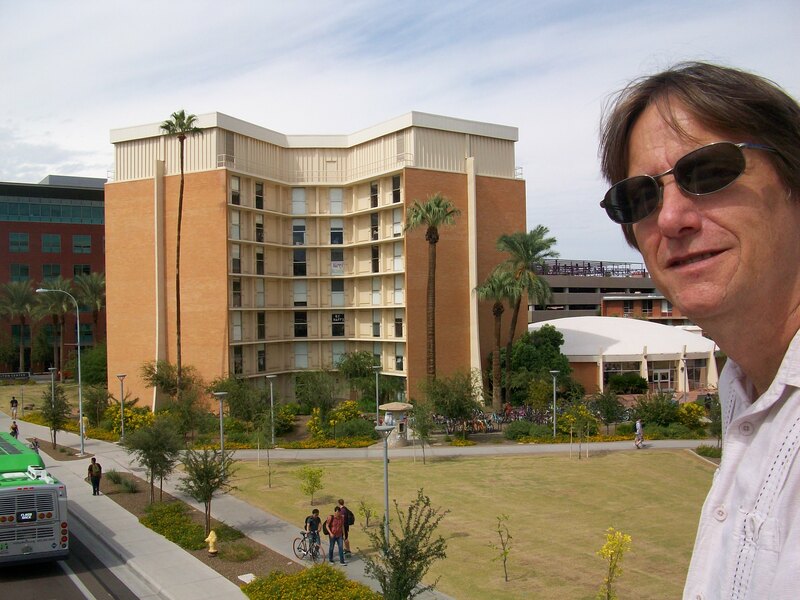 Strolling around the ASU Campus today brought me closer to Chuck, as it usually does each time we visit this area. What is it about this glimpse into my husband’s past that always evokes such emotion and closeness? I try not to overanalyze it; instead I simply appreciate it for what it is. This was his past, I am his present; when he takes me along on his walk down his personal, academic memory lane, Past and Present merge in a way that is both dynamic and precious.